Like the nearby Fur Center and Garment Center Synagogues, the Millinery Center Synaoguge was built to serve the apparel trade. Founded in 1934 by hat makers, it was designed for a cross-section of Jewish immigrants who did not pray regularly, but wanted to say Kaddish--the prayer for the dead--during the 10-month mourning period after a family member's death. When the congregation was founded, two-thirds of the nation's hat manufacturing occured in New York. 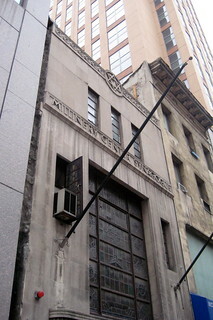 The modernist structure at 1025 Sixth Avenue was designed by H.I. Friedman and constructed in 1948. In the early 90's, the Millinery Synagogue fell into disarray, and now it has been reborn as a primarily Orthodox center. Even today, it maintains a loose connection to the garment industry, supplementing its budget by selling sheets and towels.